Hi friends! Just a quick post today to let you know that this project was posted on The Crafters Workshop blog yesterday. This canvas features brand new stencils and mediums, Gold Gesso (yes, GOLD, LOVE it! ), and Modeling Paste. Links to the specific TCW products listed below. Head on over to the TCW blog for more photos and step by step directions. 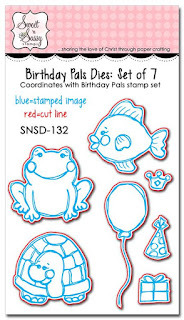 Happy Friday, friends, and welcome to this week's Sweet 'n Sassy stamp set release celebration! 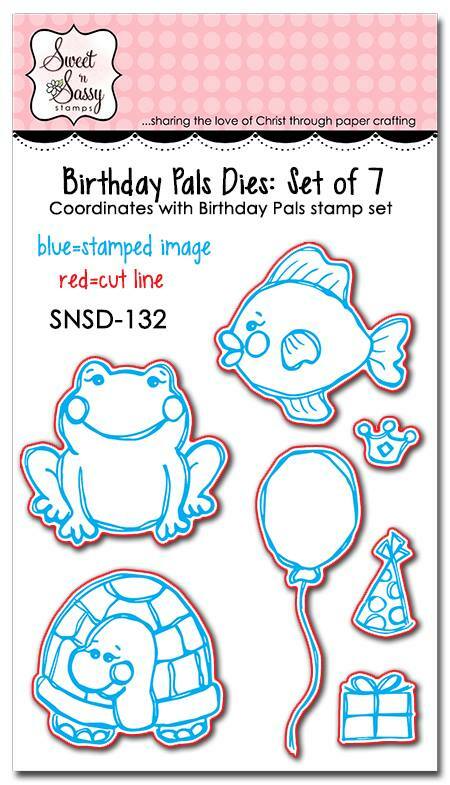 This week we're featuring the sweet stamp set, Birthday Pals. 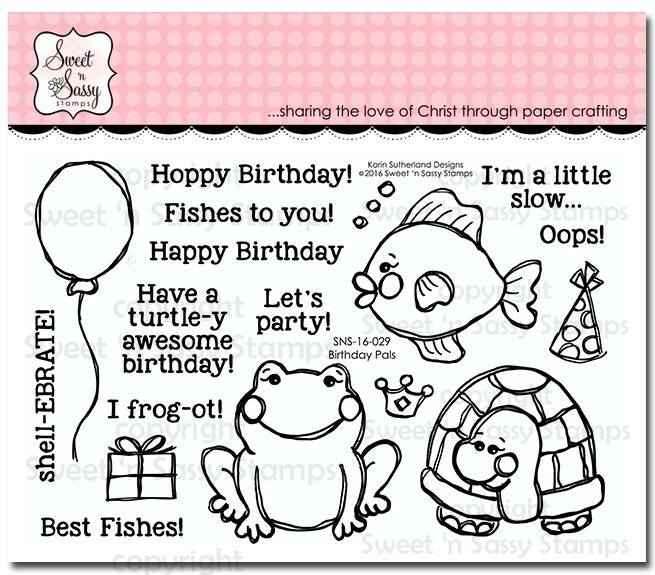 This darling set features three little critters, a whole bunch of great sentiments, and lots of critter accessories, like the hat my fish is wearing. It even comes with a matching die set! You can see the full set below. I decided to use the fish on my card and went with some no line water coloring. I used my Distress Inks to do all of the water coloring. The blue background was also created with Distress Inks, which were smooshed on a non-stick craft sheet and spritzed with water. Just place your water color paper into the wet ink for amazing results. All of the little splatters are created by continuing to pick up color from the craft sheet. I die cut a hole in the card using a Spellbinders die and created the seaweed by hand, again using Distress Inks. The fish and balloon are fussy cut and popped up with foam tape. I added some glossy accents to the balloon and dots on the hat for some shine. The sentiment was created by using the word Best from another sentiment and combining it with Fishes to you, which were embossed in white powder on black cardstock. To finish the card, I added a few white pearls. I hope you enjoyed today's card! Be sure to head over to the Sweet 'n Sassy web site to see all of the new releases! Hi friends! 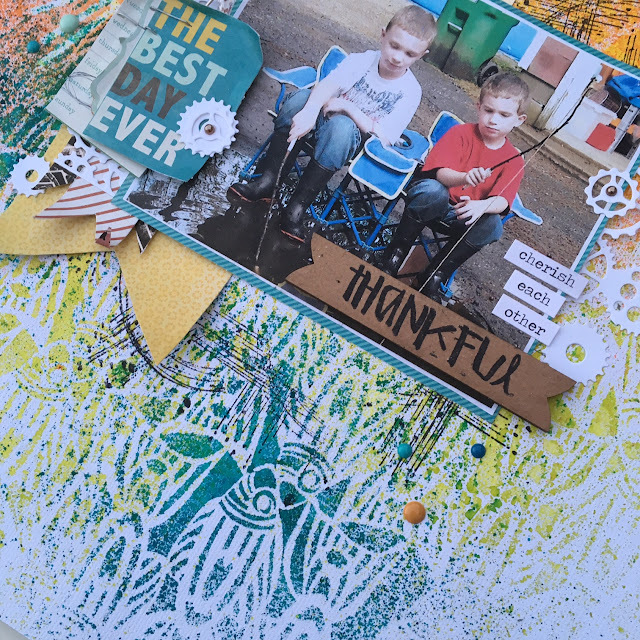 Today I'm sharing one of my Crafters Workshop projects that I created a few months ago. (To be honest, I have so many things to share...I just need to find some time to blog! And...I've been working on creating videos! Need to work through my technical issues, mostly with my very old and slow PC, but am hoping to have some new videos to share soon...stay tuned!!) OK, back to the project! I'm sharing a step-by-step tutorial of how I created this scrapbook page...it was super easy! Next, I used the Tribal Fish (TCW594) stencil, three more coordinating ink sprays and followed the same steps listed above. Once my ink sprays were completely dry, I added some stamping using the brand new Seth Apter stamps...LOVE them...by stamping in black Archival Ink. Next, I selected my photo and added a bunch of designer papers and embellishments. It's really all about layering papers, die cuts, words, pins, whatever you have on hand. Here are a few close up shots of my completed scrapbook page...A list of the products I used, stencils, stamps, etc. are linked at the end of the post. Thanks so much for joining me today! Happy Crafting! 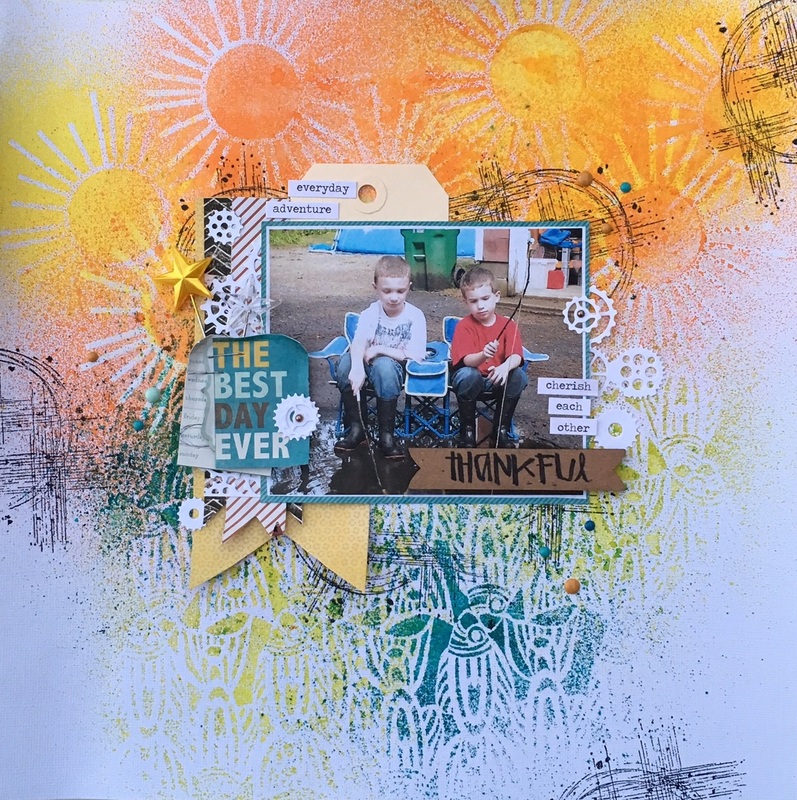 Hello friends, and welcome to this week's Sweet 'n Sassy stamp set release! 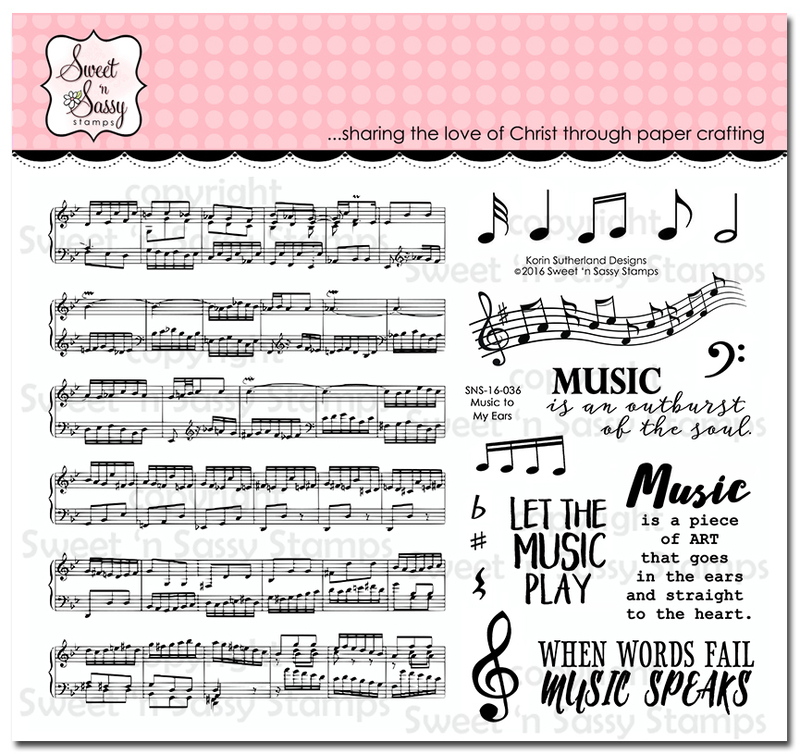 This week we're showcasing the new Music to My Ears stamp set, you can see the entire set below. 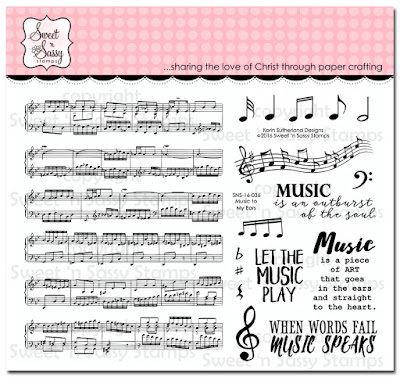 This new set includes one large background set, four music related sentiments, and 12 other stamps, including lots of music notes. So many possibilities with this set! Using VersaMark and black embossing powder, stamp the music background stamp on a piece of 5" x 5" cardstock. (I used Neenah solar white) Be sure to keep the image towards the center as you'll only see the image through the circle cut out. Using Distress Inks, smoosh some ink out on a non-stick craft sheet, and a water coloring brush add color to the background. The embossed areas will resist the inks. Since I wasn't using water color cardstock, I just dropped the ink on to the cardstock and let it spread on its own, which preventing the paper from peeling. Set aside to dry. Using Memento Ink, stamp various images from the Scribble Flowers stamp set on to a piece of scrap cardstock, color with Copics, fussy cut. Using a Spellbinders circle die, cut a large circle out of a piece of 4.75" x 4.75" cardstock, use foam tape to attach to the cardbase. Using a Spellbinders scalloped circle die, with a smaller circle die nested inside the scallop circle, cut a frame out of black cardstock, attach around circle opening. Stamp sentiment on piece of white cardstock, cut out with ribbon cut on one end. Attach sentiment, flowers, and bee using foam tape. Use Glossy Accents and Wink of Steller glitter pen to add some sparkle and shine, see up close photo below. Thanks for stopping by today, I hope you enjoyed the project! Be sure to check out the Sweet 'n Sassy web site for the newly released products (there's a new die that coordinates with the Scribble Flowers set!) along with the new Christmas stamp sets! Greetings everyone and happy Friday! 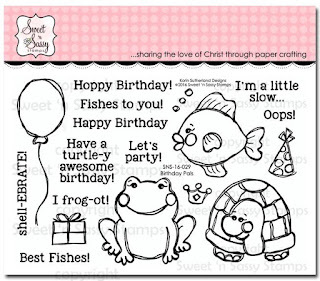 Today we start the August release celebration for Sweet 'n Sassy stamps! Today's new stamp set is a beauty...a large flower set that contains a boatload of images! When I first saw these stamps I knew I wanted to create a page full of flowers, and I combined that idea with a new technique I saw posted by Jennifer McQuire (you can see her video here). I created my floral panel by stamping some of the images in VersaMark ink, on white cardstock, and then I embossed them with white embossing powder. Once the powder had cooled, I covered the entire panel with Distress Ink, which makes the embossed images jump right off the page! I used plain water to remove some of the color within the flowers and leaves, and added some other colors to essentially re-color the images. The little bee was stamped and embossed on a scrap piece of paper and fussy cut before adding to the card front. 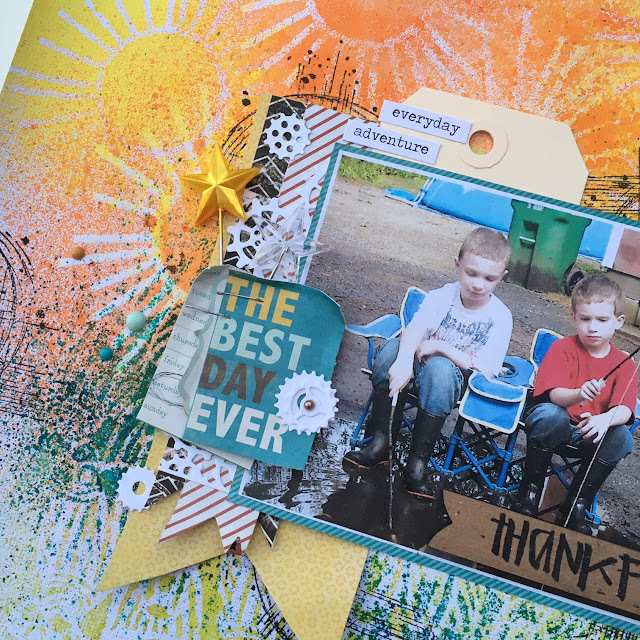 Be sure to check out the rest of the design team's projects using today's release, Scribble Flowers, and check back next Friday for the next August stamp set release!